Cristin's Cookies: GUEST POST From the Amazing LilaLoa! Wow! I'm so excited! The amazing, seriously amazing, Georganne of LilaLoa has agreed to let me interrogate her! Yes, interrogate. I was going to cross that word out and write something more "appropriate", but it is an interrogation. I mean really, when you get the opportunity to meet one of the super greats, that's what you do right? I want to know EVERYTHING! She said she would answer all my questions except if I ask her bank account number, so today this is YOUR lucky day. You get to really know the amazing Georganne of LilaLoa! You know Lila Loa from her famous chocolate cookie recipe. Everyone knows of it. If you don't, then there might just be something wrong with you! So as many of you know, I DON'T like chocolate. Weird I know. A woman that doesn't like chocolate. 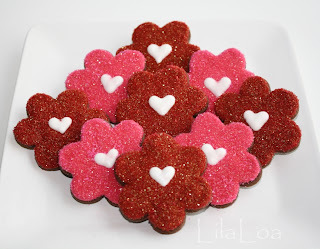 BUT I made the LilaLoa chocolate cookie recipe for my daughter who loves chocolate. I tried one and fell in love! I made them for halloween and I made them along with my regular cookies and yet I found that I was sneaking the chocolate cookies over my own! They were seriously that good. Scary good. Another way that you do already know LilaLoa is her famous fancy plaque square thingy cookie cutter. Yes, I think that's the official name. She designed and made this cookie cutter all by herself with her amazing creativity and then she allowed CopperGifts.com to make them for YOU. 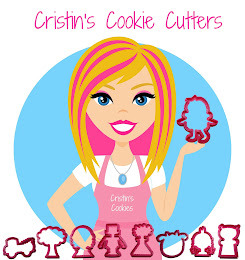 When I did my 1,000 fan give-away and asked everyone what was their dream cookie cutter on their wish list, almost everyone said LilaLoa's fancy plaque square thingy cookie cutter! She's famous, BUT do you know this side of Georganne? 1. What brought the decision to live in Korea? How long have you lived there? Where did you live previous to the move to Korea? My husband is in the military. They told him to come here, and they let us (me and my children) come with him. And aside from it being a cookie cutter pit of despair, I LOVE it here! We have been here for about 18 months and will be here for another 18 months-ish. Before living in Korea, I lived all over the US -- Utah, Georgia, Colorado, Arizona, and there was even a small stint in Wyoming. 2. When did you start cookie decorating? Do you remember what started that hobby? This might be embarrassing, but I'm just going to say it. My husband was deployed. I had a very calm baby and A LOT of empty time on my hands. Someone sent me a link to a youtube video of someone making a 3D baby cake. I was horrified, but I couldn't stop watching. And then I couldn't stop myself from watching the related video links. By the end of the day I was pretty sure that I was an expert on making cakes and decorating cookies. I mean, it took like 2 minutes and 37 seconds, how hard could it be? So I started decorating cakes and cookies. Mostly cakes. And then I moved to Korea where my oven is precisely 1/4" bigger than my 9X13" pan. So I stopped making cakes and focused on cookies. 3. How many children do you have? I seem to recall that you have 3 children. I want to say a boy, a girl and the new baby girl too. I have 3 kids -- a nearly 5 year-old boy, his toddler little sister and a brand new, doesn't sleep at all during the night because she sleeps all day long baby girl. Although, sometimes I think that I must have more than that, because, I mean, have you SEEN the mess in my living room? There is NO WAY 3 kids (only 2 of which are ambulatory) can make that kind of mess while I'm taking the garbage out. 4. 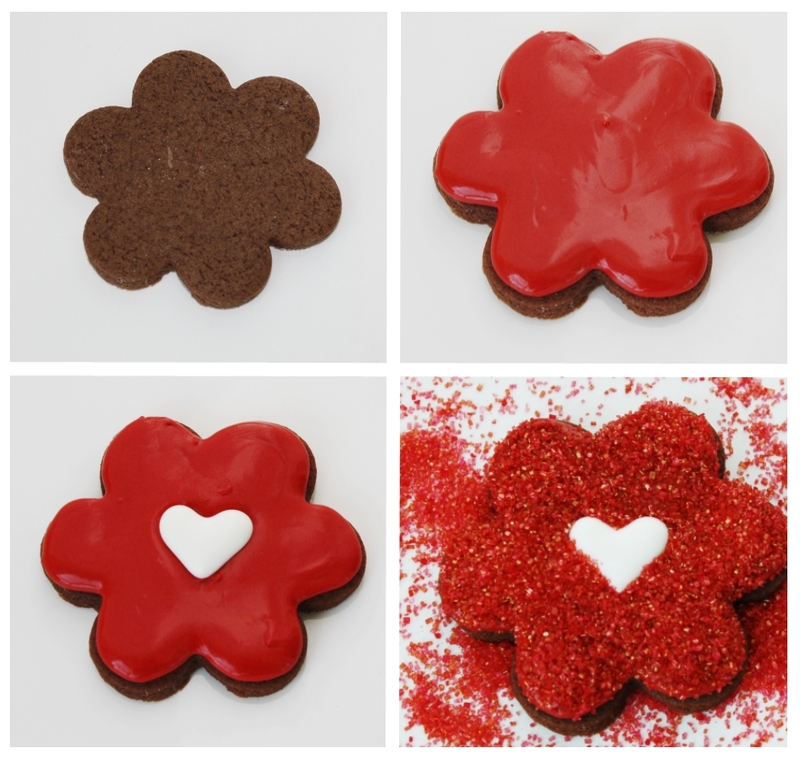 We know you make the best chocolate cookies EVER, do you also like sugar cookies? Are there other kinds of cookies that you like too? I like food. Especially in sugar form. Especially in buttery soft sugar form. If the cookie is soft...I will love it and eat it and I will have no regrets in the morning. But, and this might come as a bit of a shock -- (can someone cover the ears of the chocolate cookies?) -- my favorite cookies are actually molasses cookies. 5. Have you heard from others that didn't like chocolate that your cookies are delicious too or am I the only weirdo that doesn't like chocolate AT ALL except for your cookies and chocolate cake that isn't too chocolatey (that's a word right?). Yeah, let's be honest...I don't know of too many people that don't like chocolate to begin with. Although, when I was expecting this little child (the one on my lap NOT sleeping at midnight) I couldn't stand chocolate. Not even my own cookies. That was a tricky time to be decorating cookies, you can be sure of that. 6. What are some other hobbies of yours other than cookie decorating? White water rafting. And rock climbing. And I really like lying on the couch. 7. What is your favorite food? Favorite dessert? I love grilled cheese sandwiches. And brownies. And mashed potatoes. But not mixed together or anything. That would be weird. And because Georganne is such a total sweetie, she made us cookies too! I actually can't believe that Cristin let me come over here. I mean, I know its been a while, but I did, kind of, maybe, happen to mention on my blog that I don't like pink. (Note from Cristin - notice I made her text pink just to get back at her for that comment!) But for some reason she still likes me. Apparently, she is just that kind of sweet. So to make up for that whole "pink" thing. 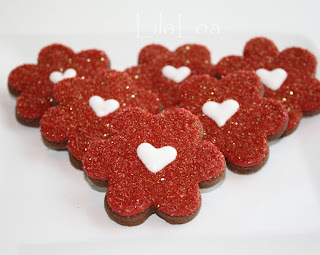 I made some cookies just for her to share with you all. After that, these cookies take literally seconds to make. Well, as long as you have your cookie dough made and rolled and cut and baked that is. So, you know, let's pretend that you have kitchen fairies that did that for you. Then these cookies would take literally seconds to make. First -- get some icing on those cookies. It doesn't have to be pretty. Then you drop a heart in the middle. Jostle it around with a toothpick if it didn't land quite where you wanted it to. And spoon some red sanding sugar over the cookie. And then raise both hands above your head and yell "DONE!" so the person timing you knows you are finished. What?! No one times you? You should come over. We can have a rodeo. Thank you to Georganne of LilaLoa for agreeing to be my guest today! 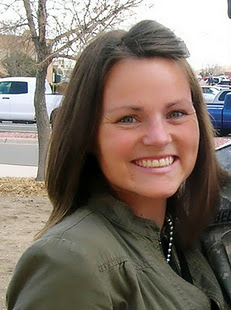 We switched blogs today so head over to her blog and see the snowman cookies that I made for her snowman parade. Thank You for sharing this with us all. You both are so talented. you make me smile whenever I read your posts. You are not only talented in baking and decorating but you both have such a way with words that you make my day brighter no matter how it starts. I've just joined your blog but look forward to following it and you have inspired me to once again try my hand at blogging. Have a great day and Thank You for brightening mine. Great interrogation, Cristin! And love the cookies, Georganne! How fun was that?! I loved your interrogation as well! You both are so talented and fun...great job! Cristin, I can't shake the visual of you conducting an interrogation of Georganne while shining a bright hot pink light into her eyes while wiping chocolate cookie crumbs off your face. And Georganne, I'm totally hanging onto that decorating idea for one of those short-notice wanna take some cookies but don't have time to decorate events. Fantastic! Love you both!!! ooh I LOVE that image Anita! You're so creative!!! Thanks for the laugh! 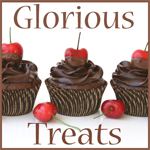 Loving both of your "Trading Places" postings and your cookies are always awesome! Blessings, Donna B. What a fun interview, from both sides:) Loved it! What a fantastic post!! Giggled through the whole thing (out loud...that's not weird is it?)!! I shared on my Facebook page...I am so excited about the giveaway...your cookies are super cute...I am browsing through the online shop...so many wonderful things! I am a little slow - I just got time to come read this. I am the self-proclaimed #1 fan of Georganne and now I will tell you a secret - she is my niece and I have never even met her. My sister Melinda (who died before meeting Georganne) had a son that was smart enough to marry this powerhouse of a woman. I had 3 children and a husband in the military (I had to fire him though) and I NEVER did a 1/10 of what she accomplishes. And her posts make me happy, and I have one of those big stress filled jobs and a couple times a week I get to sneak on the computer (because I live in an old house with NO cable or internet) and read her blogs and they make me happy enough to make my boss think I am ACTUALLY happy at work. 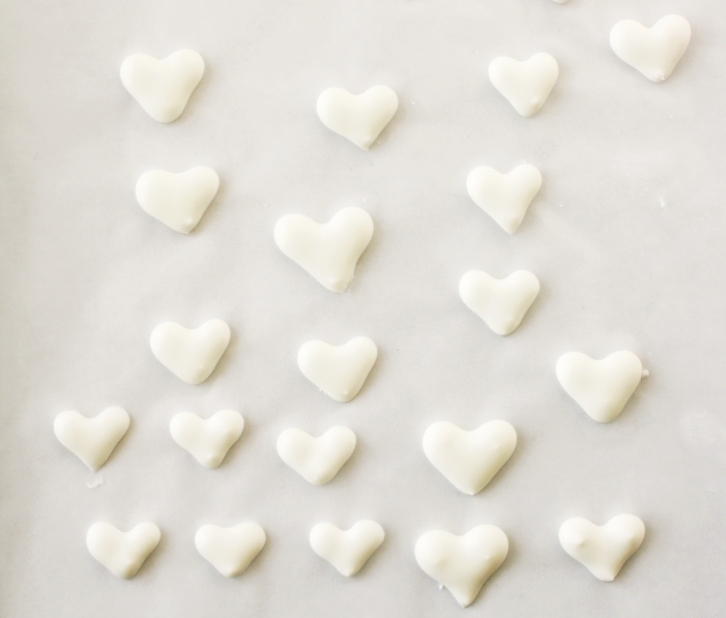 THank you all for making the world a happier more sugar and butter cream filled world.